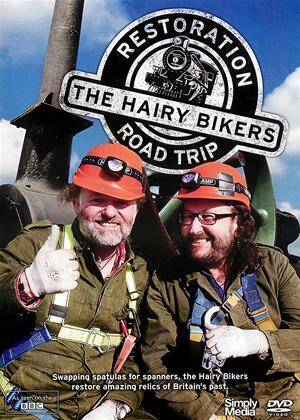 Swapping olive oil for engine grease, the Hairy Bikers tour the country to help rebuild working relics of Britan's Industrial Revolution. Si and Dave begin their restoration tour by joining ex-miners responsible for the upkeep of Derbyshire's Pleasley Colliery, now a popular visitor attraction, where Si helps restore a steam-powered winding engine. Dave puts the London Underground's oldest working steam train through its paces as it prepares to carry passengers 100 years after it went out of service, and the pair help spark up a Hampshire barn engine that has been out of action for 60 years. In Wiltshire the boys help rebuild an early traction engine of the kind that revolutionised farming. In Derbyshire they mend 100-year-old spinning mule that has lain dormant for decades and attempt to weave their own cloth, and in Cheshire they restore a canal barge once used to transport coal. As part of the biggest steam locomotive restoration in Britain, they forge a steel wheel taller than themselves for 'The Night Owl', and Dave is sent down into the cylinder of an engine to inspect its condition after 60 years of neglect. Exploring the challenging trades and skills of their forefathers, the boys go on a personal journey of discovery that offers a fascinating glimpse into the raw technology that once powered an unstoppable empire.